Things were looking to cool down and close after we heard about the Crack Down on Fake China Apple Stores. If you have missed it so we told you before that there are many fake Apple Stores opened in CHINA. After the crack down the name of the Apple Store was changed to Smart Stores. But the fake Apple Store are still operating in CHINA under some other name. 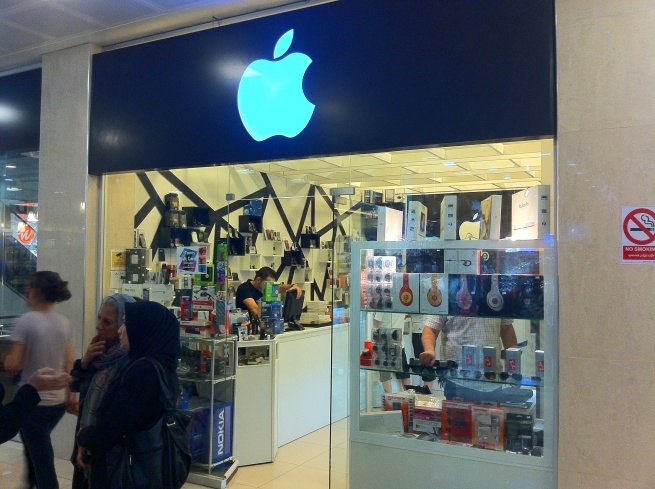 Well we thought that this could only happen in CHINA, but a 9to5mac reader in Sulaimaniya in Northern IRAQ sent them the pictur of the newly opened Store which got the Apple Logo and got some MAC Books on the top shelves for sale. This is some really EPIC store. They sell glasses and specially “NOKIA” stuff in the store under Apple logo. Looks like we got so many lovers of Apple that they open a store with Apple Logo and start to sell things. What do you guys think about this new store opened in IRAQ? If you are in IRAQ, so do send us some more photos of this store and let others know how it looks from inside and what stuff they got.